A striking mix of Celery Top Pine, Tas Oak, Myrtle and Blackwood sourced from Tasmania's sustainable forests have been utilised to make this Laminated Cheese Board. Your platter will look amazing if you add a Small Huon Pine Cheese Knife and complete the effect with a Huon Pine Mouse for a bit of fun. 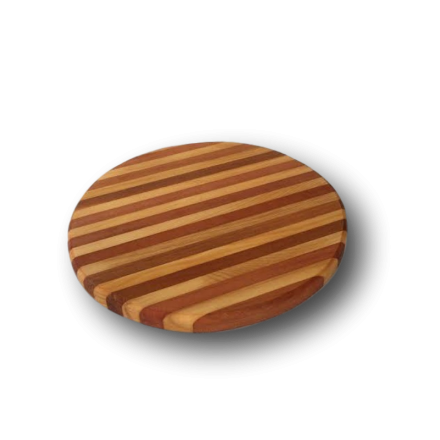 Wooden boards are kind to knives, easy to clean just a wipe down with mild detergent and leave to dry naturally. A light wipe down with vegetable oil occasionally will enhance the timber grain. Please note designs may differ very slightly regarding the width of each timber stripe.